Unemployment and the Misery Index: Have They Hit Bottom? 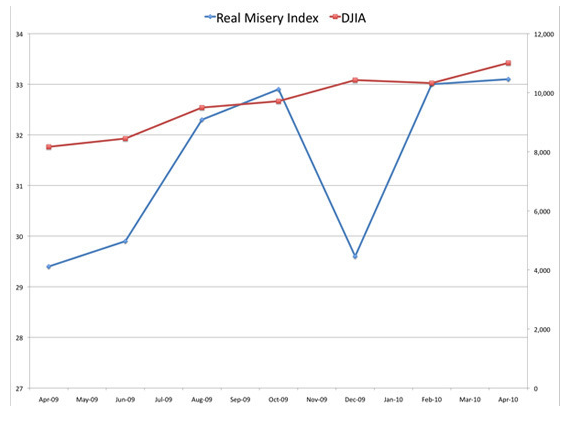 This interesting graphic comes from a piece on the Huffington Post about the Real Misery Index. The index, highlighted in blue in the graphic, suggests that despite recent improvements in the general economic outlook (which I've discussed here) things have scarcely been worse for those without employment. The main finding of the piece: that there is increasing evidence of a "two-tier economy, with those who are employed doing better amid rising consumer confidence while the unemployed suffer." Which is a fair point: the markets have risen spectacularly since their bottom last year, while the real economy continues to suffer badly. Looking at the chart, though, one big question jumps out: what on Earth accounts for the dramatic dip—and equally dramatic rise—in misery from November through January? Is that the effect of seasonal hiring? The unemployment number did take an unexpected tumble back then, but is that enough to explain the dip? And if so, what does it say about the index—or indeed the economy as a whole—that "misery" can be alleviated to such an extent by a few hundred thousand temporary retail positions? And, given that we've seen almost half a million jobs added in the last two months, can we expect to see a similarly dramatic dip in the index in the near future?